Now, I should give Sheldon credit for putting up a good statistical season last year. 23 goals, 30 assists, and a miraculous plus-1. He also has a bomb from the point and is a potent power play threat. He’s also a huge defensive liability and the Norris is awarded to the best defenceman. If you can’t play defence then you can’t win the award. Mike Green can score 30 goals, but that doesn’t mean he should win the Norris. My hate for Sheldon reached its apex in 2006-07, his final year with the Montreal Canadiens. The media hyped up how amazing Souray was because of his impressive goal totals, 26 exactly. Unfortunately, they didn’t really key in on his atrocious minus-28. That is horrible. Anytime he touched the ice he was one slow step away from a minus. And I do mean slow. I can’t say Souray is Hal Gill slow, but the comparison isn’t entirely outlandish. The Canadiens were smart enough to realize that Souray had limited value, especially since they had a real defenceman named Markov who would eventually need to be re-signed. They let Souray walk and the rest of the league didn’t really give him much interest. I’m sure there were plenty of offers, but nothing that resembled the grand payday Souray probably envisioned. Well, minus-28 will scare some people away. Didn’t scare Edmonton, although, their choices are severely limited in terms of free agent signings. Who wants to play in Edmonton? Maybe the meth scene would lure Andre Agassi to play a tourney, but that’s about it. 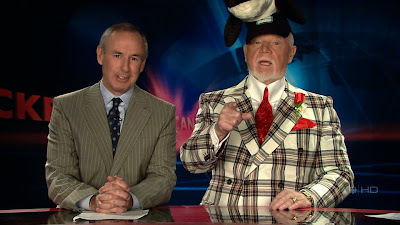 So, Don Cherry, please stop. Are you even watching these games anymore? Do you know what constitutes good hockey in the 21st century? A lack of foot speed, a penchant for brutal giveaways, and a nasty habit of taking awful penalties does not make for a Norris trophy candidate. Neither does terrible positional play and a general lack of defensive zone awareness. Sheldon, please continue to collect your minuses and enjoy your inflated Edmontonian contract.